We received the following from Fr Edward Nemeth of St Genevieve Catholic Church in Sainte Genevieve, Missouri. 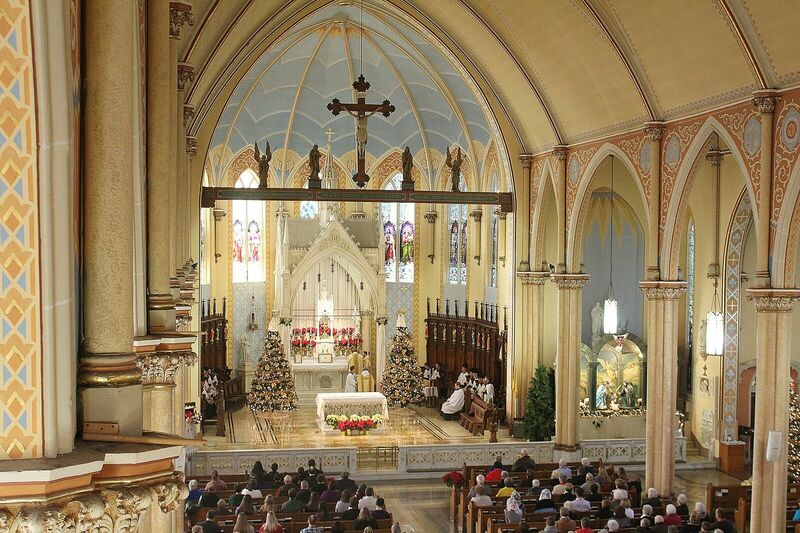 This parish was founded in 1759 in the oldest settlement in the state of Missouri, also named Ste. Genevieve. The town was founded by the French, but welcomed a large number of German Catholic immigrants in the mid 1800’s. 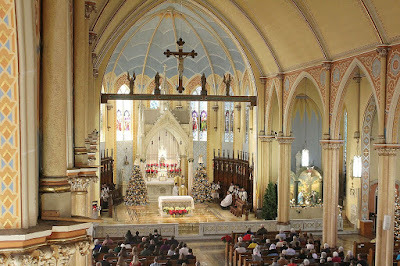 The current church was built in 1860, the fourth in the parish’s history, and has been spared any modern renovations. On January 1, 1818, Bishop William DuBourg, on his way to take possession of the soon-to-be formed Diocese of St Louis, arrived in Ste. 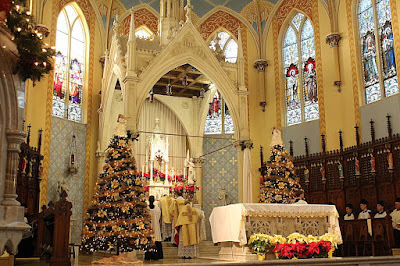 Genevieve, where he celebrated a Pontifical High Mass before heading north to his episcopal see. In order to commemorate the second centenary of this milestone, the parish organized and hosted a Solemn High Mass in the Extraordinary Form, with music provided by the local Juventutem St Louis group. 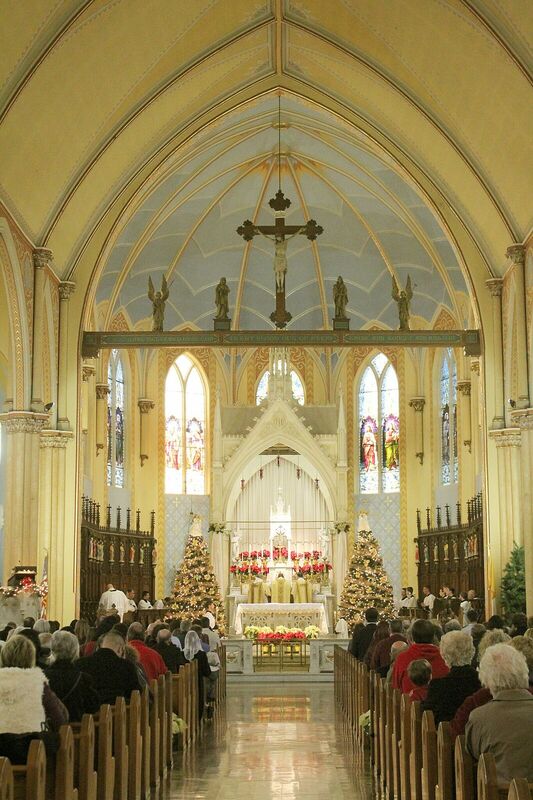 Over 600 people attended the Mass, some traveling from as far north as St Louis and as far south as Cape Girardeau. About half of the participants were parishioners, many of whom have never attended the usus antiquior. The Veni Creator Spiritus was sung at the end of the Mass to invoke the Holy Spirit’s grace upon the new year. Below we give the sermon preached for the occasion by Mons. Michael Witt. 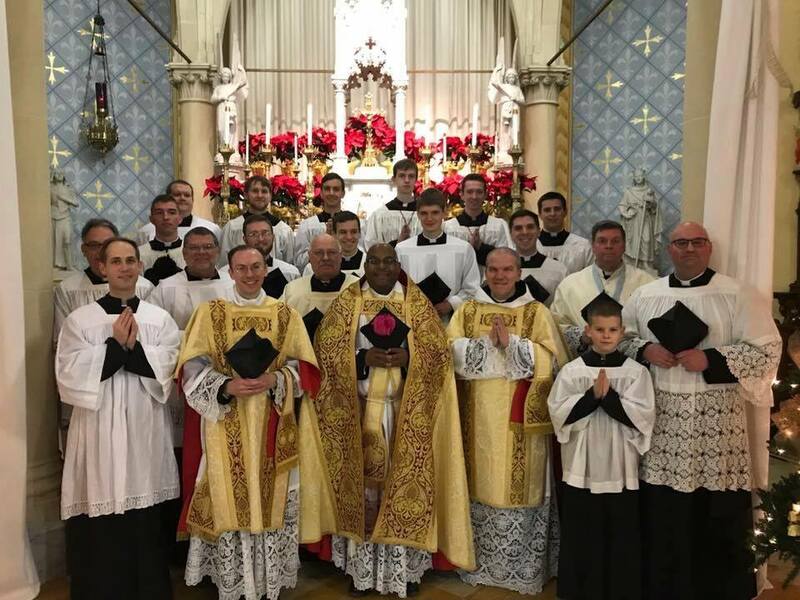 Our thanks to Fr Nemeth for sharing this with us, and for taking the initiative to commemorate this anniversary with the same Mass that Bishop DuBourg would have known 200 years ago! On December 31, 1817, Father de Andreis and forty leading citizens of Sainte Genevieve greeted their new bishop. In a solemn procession, in full ecclesiastical garb, the clergy walked from the rectory to the village church, accompanied by twenty-four servers. At the church, Bishop Du Bourg spoke eloquently of the love he had for his flock. 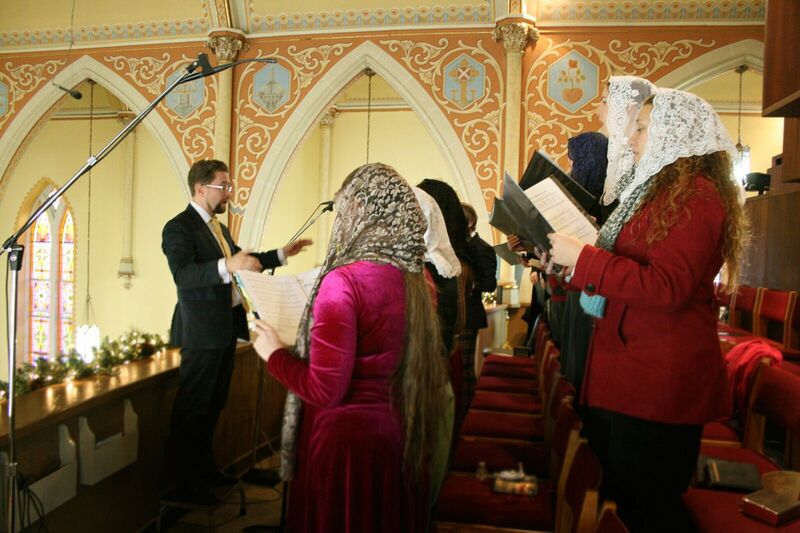 The speech was well received and the event ended with the chanting of a Te Deum. 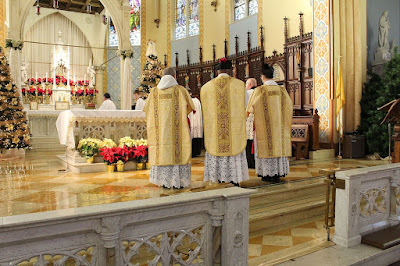 On New Year’s Day, the Catholics of Saint Genevieve were treated to a liturgy seldom celebrated there, a Pontifical High Mass. It’s no ordinary feast that descendants can celebrate a two-hundred-year-old occurrence on the exact date of the anniversary and in the same location. Where, in America’s heartland could this be done from the Alleghenies in the east to the Rockies in the west, from the headwaters of the Mississippi River to the Louisiana delta? Only in New Orleans, but not there either. Read their history. That city rejected the man we welcomed and gave a home. So, William Valentine Du Bourg came north on his way to the village of Saint Louis, his chosen see. His trek took him first to Apple Creek and then here to Sainte Genevieve where he celebrated for the first time as bishop in his diocese the Holy Eucharist. This event marked the penetration of history and place which would begin, once and for all, the Catholic evangelization of America’s heartland. Du Bourg did not come alone. He brought Vincentians like De Andreis and Rosati who would build Saint Mary’s of the Barrens in Perryville, the cradle from which would come a legion of priests as well as bishops to bring the Gospel and the sacraments to the people of the heartland. Du Bourg brought Christian Brothers with him to teach at Sainte Genevieve Academy, the building still standing in our midst, though the effort was ill-fated. Du Bourg brought Saint Rose Philippine Duchesne and the Religious of the Sacred Heart. They stopped here in Sainte Genevieve on their way to their ultimate destination, Saint Charles. Father Henry Pratte, pastor and native son, tried to persuade them to stay here. Their experience in Saint Charles no doubt prompted them to wish they had taken him up on the offer. Sainte Genevieve played an enormous role in the Catholic evangelization of the Mississippi Valley. It was here in Sainte Genevieve that Father Charles Nerinckx, co-founder of the Loretto Sisters, died on his last journey. It is here that Father James Maxwell served the Spanish authorities as pastor. Maxwell Hill, on the way to Riverview Nursing Home is named for him, for on one fateful day the priest fell from his horse, in a fatal accident. It was at Sainte Genevieve that Father Pierre Gibault learned of a stand-off on Kaskaskia Island between George Rogers Clark with his Virginia Long-knives and the British garrison of the 18th Royal Irish Regiment. Gibault’s timely intervention gave Kaskaskia to the American cause, and with it the whole of the upper Mississippi River Valley. For his patriotism, the priest had a British price on his head the rest of his life. We are surrounded by history, mid-western and Catholic. But let us not be bedazzled by historical events. 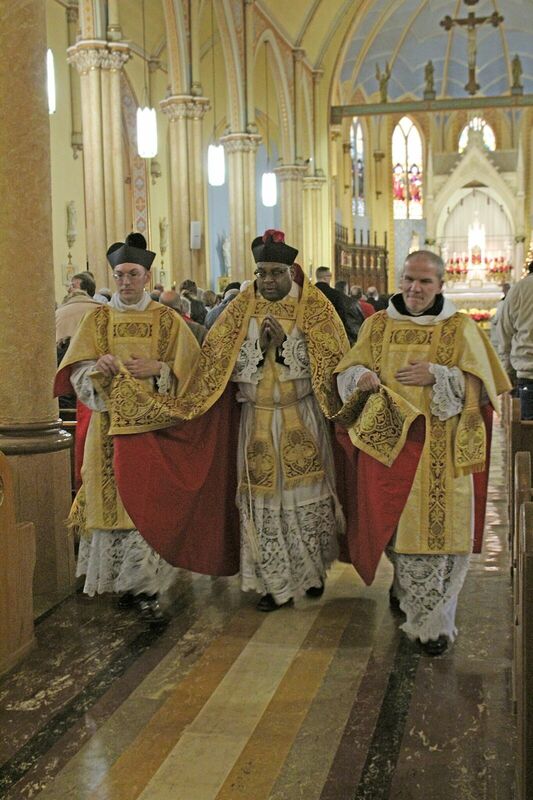 We celebrate the bicentennial arrive of Bishop Du Bourg because he came to us and celebrated Mass. He and the others who came to build up Holy Mother in America’s heartland were inspired by God to bring Christ to the creoles of the valley as well the natives of the forests and plains. 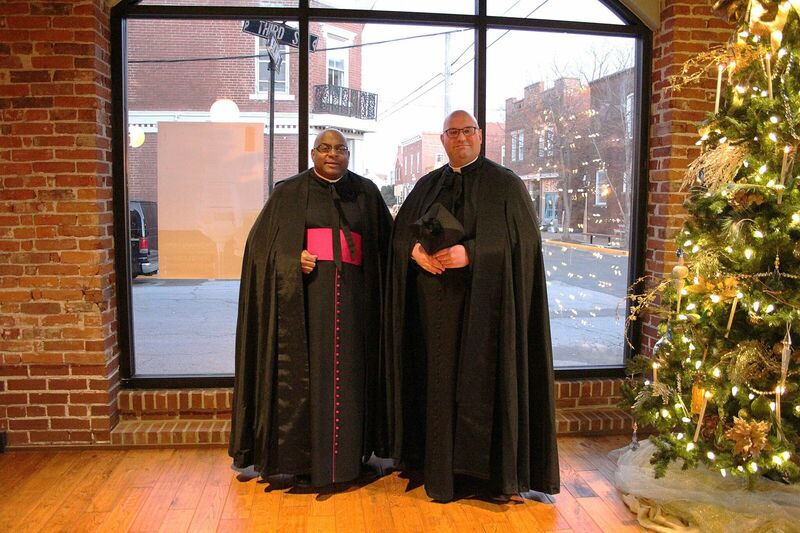 Osage came to Du Bourg seeking a Catholic priest as their chaplain. Three times Flathead Indians of Oregon made arduous journeys to Saint Louis, finally securing the mission of the Jesuits, most renowned being Father Peter DeSmet. Why this effort? Why leave lives of comfort and security behind to come to this untamed land? What can we, the descendants of these heroes and inheritors of their great work draw from them that might inspire us? They did all they did for the greater glory of God, Ad Majorem Dei Gloriam.